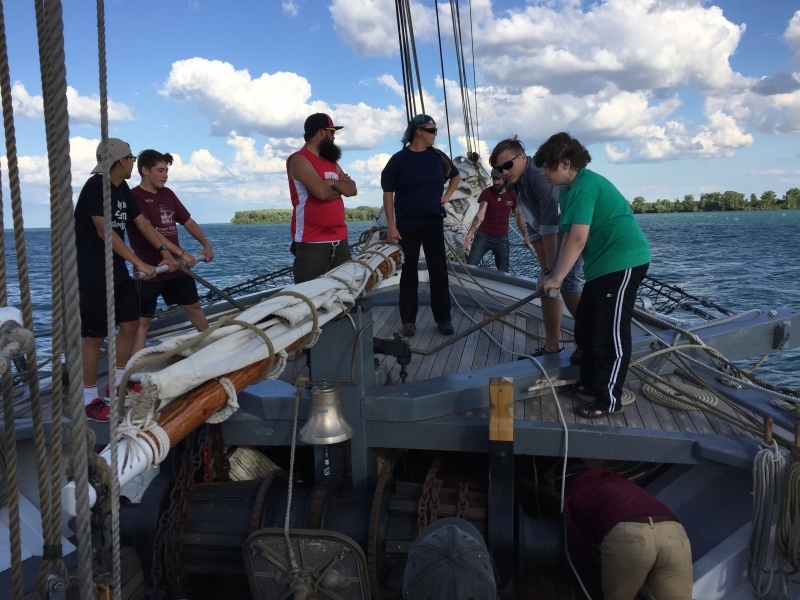 For six days, 19 Northeast Ohio teenagers sail on a Tall Ship, from Milwaukee to Cleveland, learning teamwork and gaining confidence. The Rotary Club of Cleveland has been sponsoring the trip, called Project YESS, and selecting the students since 2010, when the first Tall Ship Festival came to Cleveland. The Rotary chooses 16 novice 13- to 17-year-old students, based on applications and interviews, from diverse backgrounds and geographies around Cleveland. Another three students are program veterans. All take part in two weeks of teambuilding exercises and education before taking off on a bus for Milwaukee. They’ll sail from Milwaukee to Cleveland July 5-11 aboard Discovery World’s S/V Denis Sullivan, a recreated 19th century three-masted, Great Lakes schooner. The route winds from Lake Michigan through the Straits of Mackinac, to Lake Huron, under the Bluewater Bridge, through Lake St. Clair, down the Detroit River and across Lake Erie, back to Cleveland. The ship may stop for one night off the Erie Islands, so students can see the glacial grooves at Kelleys Island, and more. Along the way, students will be on watch for four or so hours at a time, watching for boat traffic, trimming sails, cleaning up the galley and doing whatever else it takes to make a Tall Ship sail. They’ll also learn about celestial navigation and the environment. That includes learning to be responsible and accountable, and teaching leadership skills. Want to see the Tall Ship Denis Sullivan? It’s scheduled to arrive in the Cuyahoga River, by Nautica, about 2 p.m. July 11.